The suspension can be adjusted for front and rear toe. For proper inspection and adjustment of the wheel ; alignment, do these checks: 1. Release the parking brake-to avoid an Incorrect measurement. 2. Make sure the suspension is not modified. 3. Make sure the fuel tank is full, and that the spare tire, the jack, and the t o o l s are in place on the vehicle. 4. Check the tire size and tire pressure. 5. Check the runout of the wheels and tires (see page 18-8). 6. Check the suspension ball joints (Raise and support the vehicle (see page 1-13). Hold a tire with your hands, a n d m o v e it up and down and right and left to check f o r movement). 7. Before doing alignment inspections, be sure to remove all extra weight from the vehicle, and no one should be inside the vehicle (driver or passengers). 8. Lower the vehicle to ground. Bounce the vehicle up and down several times to stabilize the suspension. 9. Check that the steering column is set at the center tilt and telescopic position. 1. Check the caster angle. - If the measurement is within specifications, measure the camber angle. - If the measurement is not within specifications, check for bent or damaged suspension components. 1. Check the camber angle. - If the measurement is within specifications, measure the toe-in. 1. Set the steering column to the middle tilt and telescopic positions. Center the steering wheel spokes, and install a steering wheel holder tool. - If adjustment is required, go to step 3. - If no adjustment is required, go to rear toe inspection/adjustment. 3. Loosen the tie-rod locknuts (A) while holding the flat surface sections (B) of the tie-rod end with a wrench, and turn both tie-rods (C) until the front toe is within specifications. 4. After adjusting, tighten the tie-rod locknuts to the specified torque. Reposition the rack-end boot if it is twisted or displaced. 5. Go to rear toe inspection/adjustment. Use commercially available computerized four wheel alignment equipment t o measure wheel alignment (caster, camber, toe, and turning angle). Follow the equipment manufacturer's instructions. 1. Release the parking brake to avoid an incorrect measurement. - If no adjustment is required, go to turning angle inspection. 3. 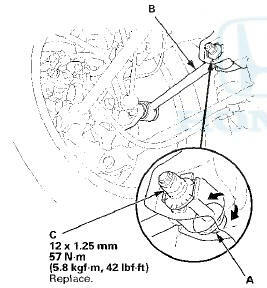 Hold the adjusting bolt (A) on the rear control arm (B), and loosen the self-locking nut (C). 4. Replace the self-locking nut with a new one, and lightly tighten it. NOTE: Always use a new self-locking nut whenever it has been tightened to the specified torque. 5. Adjust the rear toe by turning the adjusting bolt until the toe is correct. 6. Tighten the self-locking nut while holding the adjusting bolt to the specified torque. 1. Turn the wheel right and left while applying the brake, and measure the turning angle of both wheels. 2. If the measurement is not within the specifications, even up both sides of the tie-rod threaded section length while adjusting the front toe. If it is correct, but the turning angle is not within the specifications, check for bent or damaged suspension components.